I FEEL BLESSED IN TWO WAYS TODAY. ONE THAT YOU'VE ASKED ME TO SPEAK HERE TODAY AND TWO: THAT I KNEW ORLANDO CARRASCO SR. IT WAS INDEED ONE OF THE GREAT HONORS OF MY LIFE. A PRANKSTER...A MAN WHO KNEW JUST HOW TO USE FIRECRACKERS AND WATER BALLOONS TO LIVEN UP ANY EVENING OR GATHERING...AND WHO COULD FORGET THE LEGENDARY SNAKE TRICK FROM MY FRONT PORCH? A SURVIVOR...HOW MANY CAN SAY THAT THEY HAVE HAD THEIR HOMES ACTUALLY RELOCATED BY MOTHER NATURE AND LIVE TO TELL THE STORY? 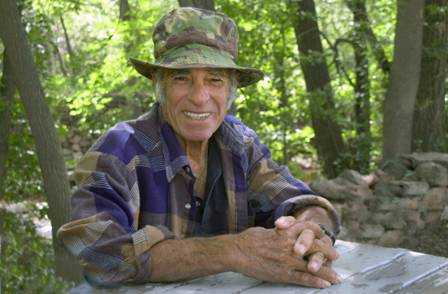 A CARPENTER...BUILDER OF TRAPS, BUILDER OF CABINS, FIXER OF HIS HOME THAT HE LIVED IN MOST OF HIS LIFE. A PLANNER...YOU NOTICE THAT HIS LOT IS ONE OF THE ONLY PLACES AFTER HURRICANE KEITH THAT HAVE GREAT COCONUT TREES...HE ALWAYS KNEW YOU HAD TO HAVE NEW GENERATIONS OF THEM. WHEN OUR CAYE WAS CHANGED OVERNIGHT FROM A TROPICAL TO A DESERT ISLAND. HIS LOT REMAINED A LITTLE COCONUT PARADISE. AND STILL IS. A CHEF....HE WASN'T JUST A COOK...HE WAS A MASTER AT LOCAL CUISINE OUT OF THAT KITCHEN OF HIS. SOME OF THE BEST MEALS IN MY MEMORY WERE FROM THE MASTER SMOKER. THE ORIGINAL PHOTO BOMBER...FACES, GRIMACES, CRAZY SMILES AND POSES...A FUN GUY TO PHOTOGRAPH. AND OF COURSE A BIT FRUSTRATING TOO. A STORYTELLER...IN A LAND OF MANY STORIES, HE WAS THE MASTER. STORY AFTER STORY, HOUR AFTER HOUR. MAGICAL, FUNNY, INTERESTING, INFORMATIVE, AND SOME TOTALLY UNBELIEVABLE. A FATHER TO SO MANY THAT HE COULD HAVE (AND ACTUALLY DID) CREATE A VILLAGE OF HIS OWN OVER THE YEARS. THAT IS EVIDENT TODAY FOR SURE. A HUSBAND...ELLEN FINALLY LANDED THE BIG GECKO...AND THEY BUILT A GREAT LIFE TOGETHER. AND TO ME...MOST OF ALL ..A FRIEND...AN AMAZING FRIEND AND TRUSTED ADVISOR FOR MORE THAN HALF OF MY LIFE. IT TURNS OUT ORLANDO WAS A CENTER OF THE NEW AND CHANGING WORLD ON CAYE CAULKER. AND WE WERE ALONG FOR THE RIDE. A RIDE THAT LASTED UNTIL JUST LAST THURSDAY...AND WHAT A RIDE IT WAS. HE WAS EXTREMELY GOOD LOOKING, LEAN, STRONG, FUNNY, WISE, AND CLEVER, AND OF COURSE HE HAD THE HAT, HIS EXTRAORDINARY TRADEMARK THAT WE ALL KNOW SO WELL. FOR DECADES IT WAS REPLACED WITH ONE JUST LIKE THE ONE HE HAD WORN OUT. OH, AND DON'T FORGET THE MANY CRAZY SUNGLASSES HE WORE WITH THEM! MIRRORS, COLORS, AND WINKING LIZARD EYES. BACK THEN, ORLANDO WAS A PLAYER! BEFORE THAT WAS A WORD FOR IT.THERE WERE TWO BIG PLAYERS ON THE CAYE, ORLANDO WITH THE HAT...AND CHOCOLATE WITH HIS STACHE! STAY CLOSE TO THOSE TWO AS THERE WERE PLENTY OF GREAT WOMEN AROUND THEM. IT WAS SOMETIMES LIKE BEING A REMORA TO THE SHARKS... AS THERE WERE A LOT OF INTERESTING LADIES PARTYING WITH THEM AT BOTH ENDS OF THE ISLAND. AND AFTER ALL THAT, THEY BOTH ENDED UP CHOOSING THE BEST OF THEM ALL, ELLEN AND ANNIE. WHEN I BROUGHT CATHI DOWN FOR THE FIRST TIME...WE CAME TO THE HOUSE AFTER A CRAZY LATE NIGHT ARRIVAL ON A CARGO BOAT FROM SAN PEDRO...GUESS WHO WAS THE FIRST TO GREET US THE NEXT MORNING....ORLANDO, THE DASHING MAN IN THE HAT! WITHOUT SKIPPING A BEAT HE WAS UP THE TREE....DOWN WITH THE COCONUTS...OUT WITH THE MACHETTE....OFF WITH THE TOPS...IN WITH THE CARIBBEAN RUM....DRINK UP....PARADISE FOUND. NEEDLESS TO SAY, CATHI WAS IN WITH THIS PLACE FROM THEN ON. AND WE HAVE BEEN TOGETHER EVER SINCE. ONE THE FUNNIEST AND BEST MEMORIES OF ORLANDO WAS AT OUR WEDDING...YES, THE TRAVELER WAS THERE! CATHI AND I WERE GETTING READY FOR OUR BIG DAY. WE HAD A LIMO WAITING AND WERE NOT QUITE READY SO WE TOLD THE LIMO DRIVER TO TAKE ELLEN AND HIM TO THE CHURCH AND WE'D FOLLOW. WELL, AS THE THRONGS ON THE STEPS OF THE CHURCH SAW THE LIMO PULL UP THEY ALL GATHERED AROUND THINKING IT WAS US. THE DOOR OPENED AND OUT CAME....ORLANDO AND ELLEN! SURPRISING THE CROWD WHO WERE ALL BUZZING, WHO ARE THOSE PEOPLE???! IT WAS ORLANDO IN HIS DASHING PURPLE SHIRT AND GET THIS....SHOES!!! ONE THING THAT THE DISEASE NEVER COULD STOP WAS HIS LOVE FOR DANCING. 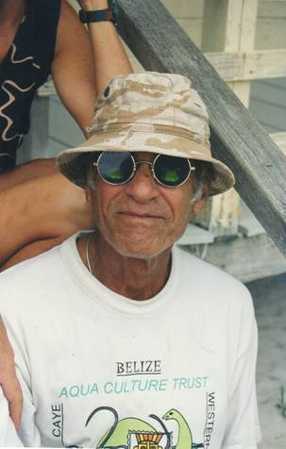 HE LOVED IT AND JUST A FEW YEARS AGO WE ALL WENT TO THE BELIZE CAYE FEST IN LOS ANGELES. AS SOON AS THE BELIZEAN BAND STARTED PLAYING, THE MAN AND HIS CANE MADE A BEELINE TO THE DANCE FLOOR. IN A MOMENT HE WAS RIGHT AT THE STAGE AND THE CROWD GAVE THE GECKO ROOM TO DANCE AROUND THAT CANE AND HE TOOK OVER CENTER STAGE WITH THE ENERGY OF OLD. THE ONLY POSITIVE THING WAS THAT IT BROUGHT THEM TO OUR HOME MANY TIMES AS THEY VISITED UCLA EACH YEAR TO GET HIM THE BEST TREATMENTS TO EXTEND IS LIFE AND HELP HIM FIGHT IT'S TERRIBLE SYMPTOMS. WE GOT AN EXTRA CHANCE TO WATCH MORGAN GROW UP AND TO BUILD ON OUR FRIENDSHIP. ORLANDO WAS A GENEROUS UNSELFISH SOUL. THE MANY VISITS ALLOWED US TO PARTIALLY REPAY THEM WITH HOSPITALITY, PARTIES AND GATHERINGS WITH NEIGHBORS AND MANY OF THE PEOPLE THAT HAD VISITED BELIZE WITH US OVER THE YEARS. MY GREATEST TRAVEL MEMORY WITH ORLANDO IS SURELY OUR BIG TRIP TO COLORADO IN 2006. IT'S A PARTY UNLIKE ANY OTHER...A GATHERING EVERY SUMMER OF PEOPLE FROM ALL OVER THE WORLD, MANY OF WHOM ARE DIRECTLY CONNECTED TO BELIZE AND ORLANDO. IT WAS A TRIP THAT EVERYONE ASSISTED WITH. WE SET UP A BASE CAMP IN BOULDER AT THE 5000 FOOT ELEVATION TO GET HIM ACCLIMATIZED TO THE ALTITUDE. DID I MENTION THE PARTY IS AT 10,000 FEET!? BARB (OUR RESIDENT NURSE) BROUGHT OXYGEN BOTTLES TO THE HIGH COUNTRY JUST IN CASE...AT THE 2 MILE HIGH MOUNTAIN CAMPGROUND WE ARRANGED FOR ORLANDO TO HAVE HIS OWN PERSONAL TRAILER, LIKE THE MOVIES STARS HAVE. HE HELD COURT IN THERE FOR DAYS. 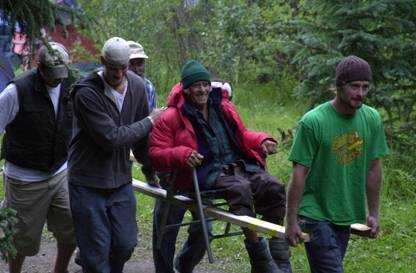 ON THE LAST NIGHT WE GOT ALL THE YOUNG STRONG MEN TO HOIST HIM UP AND CARRY HIM UP TO THE MAIN CAMPSITE ON 2X4'S AND A LAWN CHAIR. OUR VERSION OF THOSE HAND CARRIED CARRIAGES OF KINGS. IT WAS ALL GOOD UNTIL THEY STARTED CROSSING THE HAND MADE WOODEN BRIDGE. I CAN TELL YOU THAT KING 'O' WAS HOLDING ON FOR DEAR LIFE AS THEY BEGAN LEANING AND SWAYING OVER THE ICY DARK WATERS. HE SURVIVED THE SCARE AND TOOK HIS RIGHTFUL PLACE AS THE GRAND POOBAH OF THE CAMPFIRE FOR THE REST OF THE WILD EVENING. THANKS ELLEN FOR LETTING US TAKE THE GECKO TO THE HIGHEST PARTY ON EARTH. THE PHOTO I TOOK ON THE COVER OF TODAY'S PROGRAM IS FROM THAT WEEKEND, AND YOU CAN CLEARLY SEE HIS HAPPINESS. WE'RE GONNA MISS OUR CHIEF CHEF AND SMOKER. PEOPLE FLY IN FROM ALL OVER SO THEY DON'T MISS HIS BIRTHDAY FOR THE BEST SMOKED TURKEYS IN THE WORLD, ALL DONE IN OLD REFRIDGERATORS AND BROKEN STOVES IN THE BACKYARD UNDER THE BANANA TREES. HE COULD GO ON HIS DOCK, CATCH BONEFISH AND SMOKE THEM SO THEY TASTED LIKE NOTHING ELSE. SHARK PANADAS, LOBSTER, CRAB AND EGGS, RICE AND BEANS. AND LET'S NOT FORGET HIS FAVORITE TRICK...SUCKING ON CHICKEN FEET! OOOOH JUST TO GROSS OUT THE GRINGOS...AND MAYBE EVEN SOME OF YOU! SPEAKING OF HIS BIRTHDAY, WATCHING HIM WILDLY SWING TIME AND TIME AGAIN AT THE PINATTAS HANGING FROM HIS BACKYARD TREE WERE SOME OF THE FUNNIEST MOMENTS IN MY LIFE. IF THERE WAS EVER A TIME TO PEE IN YOUR PANTS FROM LAUGHING, THAT WAS IT. IT'S A FUNNY THING THAT DURING THE MANY TIMES THAT WE VISITED THE REEF AND DIVE SPOTS, I NEVER SAW HIM GET INTO THE WATER TO SWIM OR SNORKEL EXCEPT FOR WHEN HE WAS WINDSURFING, OR RATHER WHEN HE CRASHED WHILE WINDSURFING. 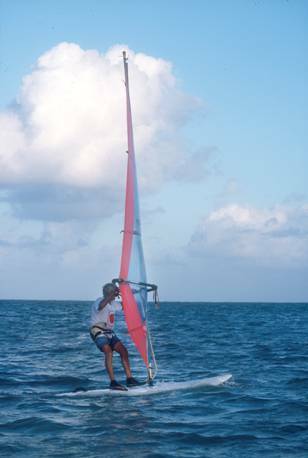 I THINK THAT IS WHY HE BECAME GOOD AT WINDSURFING SO QUICKLY, SO THAT HE NEVER HAD TO GET WET! WHATEVER IT WAS, IT WORKED, AND I WAS HAPPY THAT I GOT TO SEE HIM ACTUALLY SAIL THE BOARD FOR HIS LAST TIME JUST A FEW YEARS AGO. IT REALLY MADE HIM FEEL SO FREE. I AM ALSO PROUD THAT MY HOUSE SERVED AS ORLANDO'S HIDEAWAY. WHETHER DAY OR EVENING ONE COULD FIND HIM SWINGING OR NAPPING DOWNSTAIRS IN THE HAMMOCK HE MADE. HE REALLY LOVED THAT SPOT. WE EVEN HAD HIS OWN PERSONAL GATE IN THE FENCE. HAVING TOM YOUNG BUILD OUR BIG DECK WAS THE BEST THING WE DID. IT PROVIDED COUNTLESS HOURS OF COOL PRIVATE TIME TO SIT IN THE BACK CORNER FOR CONVERSATIONS, STORIES, AND LAUGHTER OR JUST SITTING ON THE RAILING WATCHING THE WORLD OF THE CAYE WALK AND DRIVE BY. IT ALSO PROVIDED THE DARK VIEWING BALCONY FROM WHICH WE COULD ALL LIE IN WAIT FOR THE TRICK OF TRICKS ON THOSE INNOCENTS PASSING BY…THE SNAKE! !….TRULY THE FUNNIEST AND MOST ENTERAINING OF ALL PRACTICAL JOKES. DURING THE DAY, WE ENJOYED WATCHING ORLANDO CRUISE BY ON HIS FAVORITE MEANS OF TRANSPORT, HIS THREE WHEELER BIKE, FILLED WITH STUFF FOR BUILDING UP HIS LOT IN BACK. NIGHTLY VISITS FROM ORLANDO WERE A SPECIAL TREAT. HIS STORIES WERE INFAMOUS...AND YES WE HEARD A FEW...MORE THAN A FEW TIMES OVER. BUT THERE WERE SO MANY TALES OF BUSH SPIRITS, HURRICANES, FISHING AT CAYE GLORY, SAILING BACK AND FORTH TO BELIZE CITY, CHASING JAGUARS IN MAYAN VILLAGES, REMEDIES OF NATURE, AND JUST PLAIN TALL TALES THAT PROVIDED NIGHTS OF WONDER, HISTORY, AND OF COURSE IMAGINATION. JUST IN JULY AT MY HOUSE IN CALIFORNIA, OUR LAST VISIT TOGETHER, HE TOLD ME NEW TALES OF BEING A KID IN BELIZE CITY AFTER THE GREAT HURRICANE, AND HAVING TO FORM A GANG WITH SYD AND SOME CAYE BOYS SO THE BIG KIDS WOULDN'T STEAL PRECIOUS ORANGES FROM THEM. FROM THOSE EARLY DAYS TO THE MOST RECENT TIMES, FEW MEN HAVE SEEN AS MUCH CHANGE AS ORLANDO AND HIS GENERATION. WE HAVE BEEN THE LUCKY ONES TO HAVE OUR LIVES CHANGED SO MUCH BY ONE PERSON. 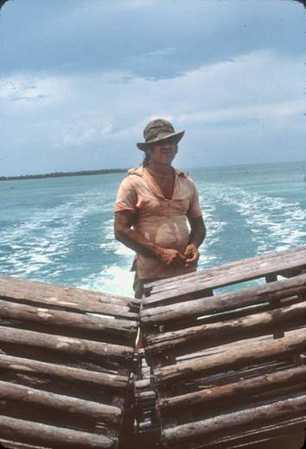 HIS LOVE OF LIFE, NATURE, THIS CAYE, HIS FRIENDS AND HIS FAMILY IS UNPARALLELED. I KNOW THAT HE CHANGED MY LIFE IN SO MANY PROFOUND AND POSITIVE WAYS AS HE DID FOR MANY THAT KNEW HIM. I WILL FOREVER SEE HIM ON HIS BEACH, UNDER THE COCONUT TREE, SITTING ON A LOBSTER TRAP WITH HIS SIGNATURE HAT, THE BREEZE IN HIS FACE, LOOKING OUT AT THE BLUE GREEN SEA AS THE WHITE LINE FORMS ON THE REEF HE SO LOVED. I WILL MISS YOU FOREVER ORLANDO. BE AT PEACE AND WATCH OVER US.